Frank Petkunas, Assistant Regional Superintendent of Iroquois-Kankakee County schools, has been working in education since August of 2000. He began his teaching career at Peotone High school as a biology and physical science teacher. In 2002, he joined the faculty at Bradley-Bourbonnais Community High School as a science teacher. In 2007, Frank became the science department chair at BBCHS. 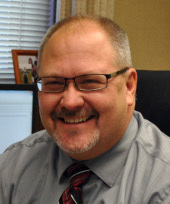 In July 2012, Frank accepted the position of Assistant Regional Superintendent of schools for the I-KAN Regional Office of Education. In this capacity, he provides professional development for area educators and helps support the programs and services provided by the regional office of education. Frank has been involved with reviewing NGSS since the writing process began. Frank also serves on the Illinois state adoption committee for NGSS, and the BCSSE team for Illinois. Frank holds a bachelor’s degree in biology with a teaching certificate in secondary education from Governors State University and a master’s degree in educational leadership from Olivet Nazarene University. He also holds an additional bachelor’s degree in business administration from GSU. Frank, his wife Sonya, and their 3 sons, reside in Limestone, and have lived in the Kankakee area their entire lives.